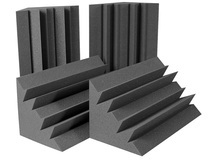 Editors Keys announces the availability of the second edition of its Portable Vocal Booth acoustic panel. Auralex will introduce another addition to its line of products at Winter NAMM 2011 (Booth 6698, Hall A); the SonoLite fabric wrapped Studiofoam Pro panel. Following the recent release of its stand-alone, tunable Vari Bass, acoustic solutions manufacturer Vicoustic has turned its attention to a more permanent solution for addressing low frequency issues. The new IsoTool range aims at isolating vocals with Voxguard, reducing mic stand vibrations with TriPad, or incorporating an iPhone or iPod Touch into your stage set-up with TelePad. Applied to both walls and ceilings, the Multi Fusor DC2 is designed to provide multi-reflection on both vertical and horizontal planes in sound critical spaces, performing on high frequencies to brighten and clarify the sound.